An embarrassment of riches: I can’t attend everything I would like to. When it came down to it on Sunday I found myself driving towards town on West End after I got off the ramp from 440 instead of away from town towards St. George’s. As much as I love Nashville’s historical performance ensemble and didn’t want to miss their last concert of the season, the Brahms Requiem has been an important part of my life for nearly thirty years, and I usually will make an effort to go when I have the opportunity to hear it performed live. West End United Methodist is an imposing gothic church across the street from Vanderbilt, and although I have driven by it hundreds of times I’ve only been inside once before, when the choirs from Blair School of Music presented a Britten Centenary concert there about a year and half ago. The old stone sanctuary is built on the cross, with marvelous stained glass windows on either side of the nave casting a warm glow over the entire room. I went alone to this concert, driving through what the Japanese call kitsune no yomeiri – “the fox’s wedding” – (a sun shower) to arrive at the church shortly before the concert. After parking I made my way to the sanctuary, greeted a few musicians I know who were playing in the orchestra and found a seat in the ninth row of pews. I looked around the congregation but didn’t see anyone I recognized, and so I was left alone with my thoughts for a few minutes before the music began. Brahms Requiem is one of those pieces I know so well that I can hear the entire piece in my head from start to finish, all seven movements. We all have this: songs or pieces that we’ve known so long, heard so many times, they become part of the fabric of our minds and our hearts, and our memories. When I was a student at The University of Tampa in the 1980s I sang bass in The Tampa Bay Master Chorale under the direction of Robert Summer, and performed the Brahms Requiem with The Florida Orchestra in 1986. Robert Summer was a protégé of Robert Shaw, and I remember being required to go to the music library at The University of South Florida where Dr. Summer taught, to copy all the marks in the vocal score on reserve into my own score before rehearsals began – many of the markings having originated from Shaw. I still have this score, as well as the Kalmus full score I paid something like $50 for (at the time Dover had only begun to print inexpensive orchestral scores and the Brahms Requiem was not yet part of their catalog). At that time I was an aspiring conductor and very much enthralled by Brahms (as I am to this day), and Dr. Summer allowed me to sit in on his rehearsals with the orchestra. I remember sitting behind the horns during the rehearsals, attempting to audiate the choir part as I followed the score while the orchestra played alone. I was dating the woman who would become my wife that fall, and Brahms Requiem was the first performance I participated in that she attended. Also during this time I had a part time job as youth choir director at Palma Ceia Presbyterian Church in Tampa, and the following spring their choir director David Mitchell asked me to sing the baritone solos in A German Requiem, in addition to joining the church’s chancel choir on the choruses. This time the performance was in English – I remember clearly how different if felt singing the translation, and the need to change some of the phrasing because of the different text. All of this is to say that, alone in the pew surrounded by strangers, in an atmosphere that induced complete absorption in the music, it was difficult at times to refrain from singing along with the choir. 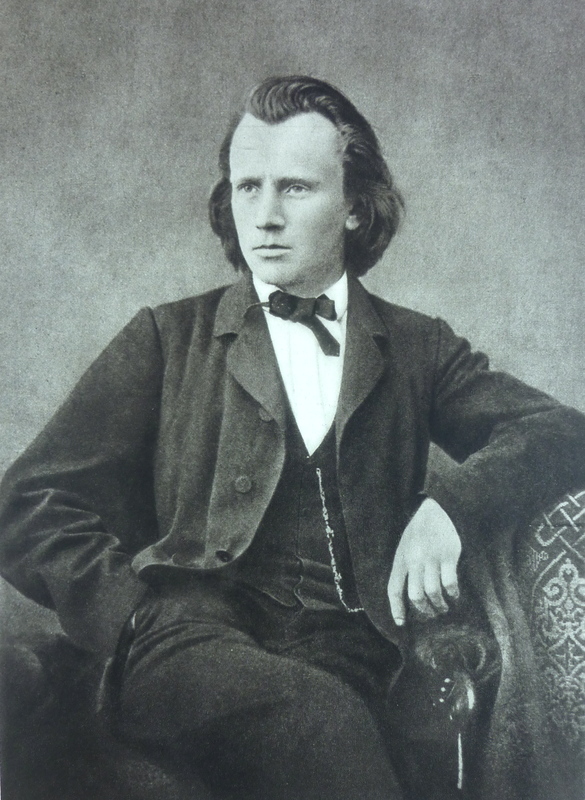 Johannes Brahms is unusual among composers whose reputations are largely built on orchestral and chamber works in that much of his early employment as a practicing musician was as a choral director. He directed women’s choirs in Hamburg beginning in 1857 and in 1863, moved to Vienna to accept the leadership of the Singacademie, the city’s first mixed choir, established only five years previously in 1858. The choir is still in existence today. His practical experience standing in front of choirs as well as the many folksong arrangements and other compositions he wrote for these groups certainly informed and prepared him for the composition of the Requiem. A German Requiem is very much a choral piece – even more so than the Mozart Requiem, which features many movements for soloists and orchestra without choir. In the Brahms Requiem the choir sings in every movement, carries four of the seven alone, and really plays a supporting role only in the fifth movement (which was not part of his original conception, and was not performed at the premiere but added later), which features the soprano soloist. In this emphasis on the choir Brahms may have been influenced by Cherubini’s C minor Requiem, which was popular throughout the nineteenth century and admired by Beethoven and Schumann. The Cherubini Requiem is scored for choir and orchestra only, without soloists. The orchestra was seated across the transept of the church – twenty string players with the winds and brass scattered behind them and the timpanist perched behind and above the cello section. Amidst the traditional cacophony of an orchestra warming up before a performance I could pick out a flute playing the high opening phrase of the fourth movement and the horn strains that accompany the choir’s first statement of the word Freude (joy) in the second movement. Soon the congregation quieted down and the choir filed into the chancel. West End UMC Pastor Michael Williams climbed the steps into the pulpit and addressed us. In one of the most brief yet warmest introductions to such an event I have witnessed, he welcomed all, stated that this performance was part of the church’s ministry and expressed the wish that all would leave the concert with what they needed to get from it. No prayers were offered, no baskets were passed, no offering was taken up. The concert was presented as a gift to the community. He stepped down and music director Matthew Phelps entered and walked to the podium. Dr. Phelps directed the entire performance from memory, and his deep immersion in the music and the work he and the choir have done were apparent from the very opening chorus. Throughout most of the performance the balance between the more than sixty member choir and the orchestra was good – I was able to supply the choral parts from my own memory in some of the grander moments where a full orchestration overwhelmed the choir. What was most palpable to me was the feeling that the musicians – choir, orchestra, and conductor – brought to this performance. It was clear that for many of those involved, this music is deeply meaningful. The last time I heard the Brahms Requiem was when the symphony and the symphony chorus performed it at the end of last season – I can’t remember if I had listened to a recording of it in the last year or not, but this was the first live performance I witnessed in nearly a year. As so often I have been reminded in my work as a musician over the years, there is no substitute for a living, breathing performance. As vital as recording technology has become to our work as musicians, it is merely a tool and a resource – it can never replace sharing the same space with the musicians and creating or recreating the music together in the moment. When I first encountered and performed the Brahms Requiem nearly thirty years ago, I was one of the youngest if not the youngest singer in the Tampa Bay Master Chorale, and by far the youngest participant in the performance at Palma Ceia Presbyterian. Many, if not most, of the singers I shared those rehearsals and concerts with are dead now, or facing the ends of their lives in the next few years. Perhaps it is the nature of attending such a performance alone with my memories, in an old stone church on a rainy afternoon, that brought them to mind – many whose names and faces I can no longer recall, but with whom I shared such formative experiences. I will never see or speak to them again, yet we shared some moments, some experiences, that will always stay with me. There are pieces of music – works of art – that have a power beyond the cathartic. While some music seems to express what words cannot, there are also things which even music cannot express. Music and words can only point our attention towards these things, reorient us towards what is important, help us to feel grounded within our own lives. I feel so grateful to live in a community that supports and provides for such experiences as I had on Sunday. 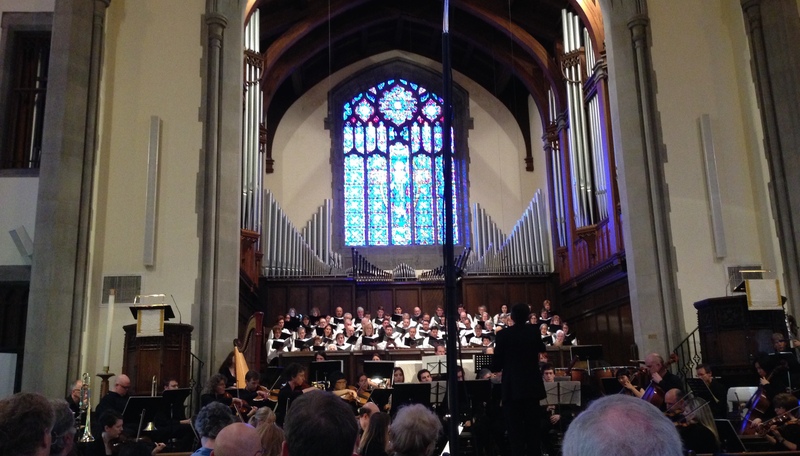 By walterbitner in Choral, Choral Music in Nashville, Community, Orchestral on April 21, 2015 .